While protein proves important in your greyhound's diet, meat isn't the only source. You can substitute cottage cheese or tofu for meat in a recipe for homemade greyhound dog food. You can also help your dog avoid preservatives, sweeteners and artificial colorings with a homemade diet. Making your greyhound's food can give you personal satisfaction and your dog a healthier diet as long as you take into account your dog's activity level and nutritional needs. Place equal parts of raw, pre-ground meat and vegetables in a food processor. Pre-ground meat can include liver and beef. Vegetable choices can include carrots, collard greens, celery, peas and potatoes. If using potatoes, boil or bake them first. Crack and add one egg for every cup of vegetables and meat you place in the food processor. For example, if you have 4 cups of meat and veggies, add four raw eggs. Add 1 or 2 tsp. of flaxseed oil, if desired; this oil contains essential fatty acids and promotes healthy skin and coat. Process all of the ingredients in the food processor until thoroughly mixed. Divide and store the mixture in equal portions. Freeze portions that you won't be using within a few days. Brown 1 pound of ground beef or other pre-ground meat in a frying pan. Cook 2 cups of whole-grain rice. Steam one bag of unseasoned frozen vegetables or 1 pound of fresh vegetables. Vegetable choices can include carrots, celery, potatoes, green beans and yams. Pulse the vegetables in the food processor until they are coarsely chopped. Combine the vegetables, ground meat, 2 cups of whole grain rice and 1 to 2 pounds of plain, unsweetened yogurt in a large bowl. Stir together with a spoon to combine. Divide the mixture into equal portions in freezer-proof containers. Freeze portions that you won't use within one day. Feed a pound of food per day for every 25 pounds your greyhound weighs, according to GreyhoundWelfare.org. Consult your dog's veterinarian with questions about portion sizes. All dogs need some type of abrasive food or kibble to help clean their teeth. Include something to meet your greyhound's needs. Before you make a large quantity of a certain recipe, make a small batch and allow your greyhound to try it first. If the dog likes it, make a larger quantity next time. 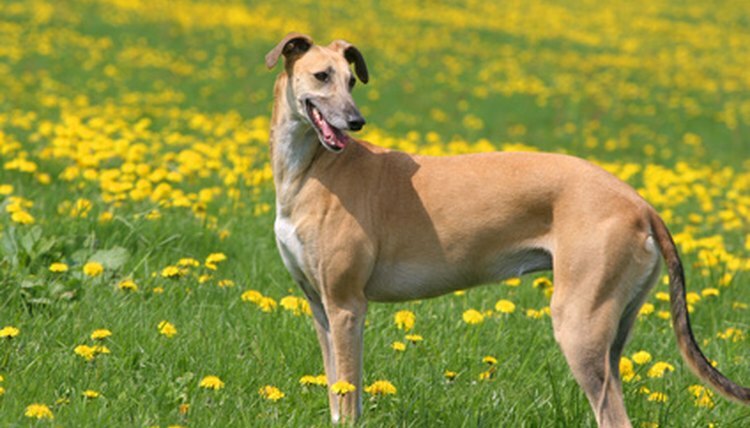 Ensure that your greyhound will receive a healthy diet that meets all its nutritional needs. Discuss the homemade diet with your vet before beginning.